Deanna Hutton, Love's Labrythinth, encaustic, paper, ink and shellac on birch panel, 12" x 16" x 1.5"
Deanna Hutton is visual artist/designer living and working in Toronto, Canada. 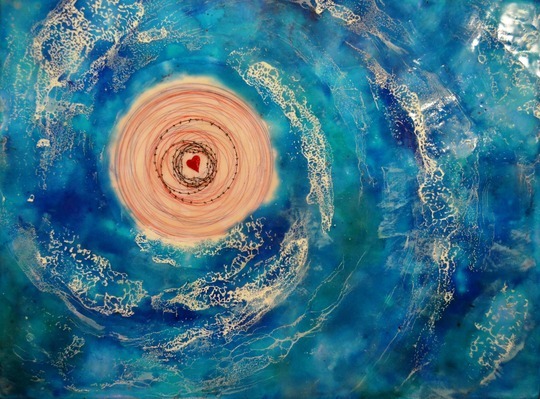 In 2010, Deanna discovered an incredible passion for creating with encaustic medium. She loves the way the tactile and sculptural qualities of this medium give her the freedom to experiment - using different tools and techniques; applying multiple layers, colour, and found objects; manipulating the wax with heat; rubbing in and scraping back – the possibilities are endless. Deanna continues to expand her learning of encaustic painting through hands-on workshops and experimentation. Her first solo show was in Toronto in October 2011 followed by another in May 2013. Her next solo show is planned for fall 2014. Being part of this international project was a wonderful experience. Thinking about the energy of all the artists that came before me was incredibly inspiring. When I first looked at the piece I was given, I found it difficult to get beyond my literal translation of the words used and imagine what came before. The longer I let it percolate, the more expansive my imaginings became until finally I was able to see. Once I began the painting process, things flowed very quickly and the image for my piece solidified in my mind.